a) We lined up a variety of grains and beans and poured them into origami boxes we had folded together and labeled, then looked at the similarities and differences. Much discussion on grain vs. bean/legume and the ways that many cultures around the world eat a combination of beans and grains which nutritionally results in more complete proteins. Origami in a culinary arts class? We needed some hands-on activity, and origami is great as long as you are prepared for first timers. Often there will be a hidden origami pro in one student which can help too. I’m already running into students being organized enough to be able to produce a lot of output and it gets challenging to find ways to keep their hands busy without ending up with a 5 gallon bucket of chopped carrots after half an hour. I was hoping origami would help with this. It can when you have enough “buy in” and the project is doable. Having a cutting project (such as trimming parchment circles for steaming baskets) is also good, but you need pairs of scissors. b) We made hot cereal. Many students have never had whole oats before and it is close enough in flavor to rolled oats that they could compare and contrast – and several asked when we could have hot oats again. 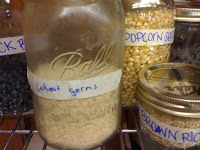 c) We put things away and organized a grain and bean shelf. I love watching the discovery that happens as someone takes ownership of their project. In the picture at right of some of our jars, this student’s labeling was essentially correct – it is a wonderful reminder about experience, generations and our changing lifestyles. d) We got into hummus and pita bread. As long as you have a baking stone and get it up to temperature, pita bread is more satisfying than flat bread because it bakes quickly and watching it puff up in the oven is immediately gratifying. Roll the circles of dough out paper thin for this result. There was more discovery as students blended or pounded the “seeds” of chick peas into a familiar spread with garlic, sesame tahini and lemon juice. Many had never tasted it before and we compared it to classic tomato sauce on our freshly baked pita. 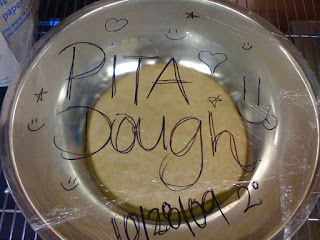 We had to make more pita dough for later in the week. e) Finale Friday: hummus with pita, chicken soup with quinoa, tabouleh (bulgar is an easy grain to make in the class room), and an onion-pepper relish. It was a successful meal. Next time? This could be broken down into more lengthy projects but for our class these quick glimmers were good ways to expose without over saturating. It helped keep the curiosity alive in the room.